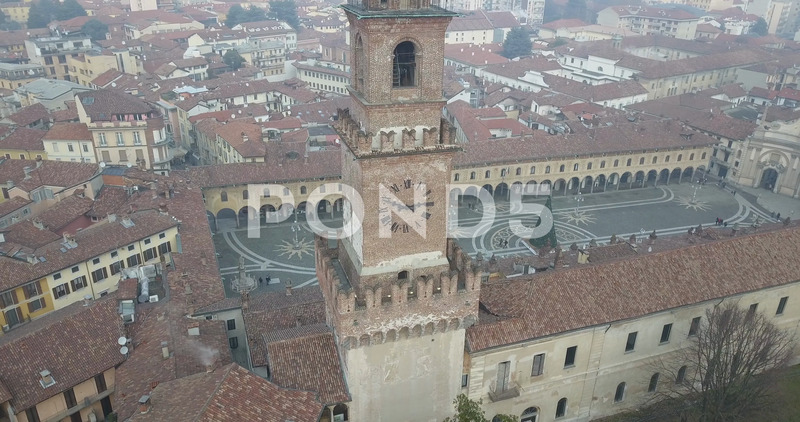 Drone Aerial Flying Over Vigevano which is a town and comune in the province of Pavia, Lombardy in northern Italy. A historic art town, it is also renowned for shoemaking and is one of the main centres of Lomellina, a rice-growing agricultural district. Vigevano received the honorary title of city with a decree of Duke Francis II Sforza on 2 February 1532. It is famed for its beautiful Renaissance "Piazza Ducale" in the centre of the town.